Here it is: another week of how dinner went down in our house. Grocery shopping day snuck up on me and I wasn’t fully armed with a meal plan this week. I hate when that happens because grocery shopping inevitably takes longer and I often either forget something I need or buy things I don’t need. This week I did better than usual meal planning on the fly as I walked down the grocery store aisles and ended up with a good week of eats. Read on. We went to a Super Bowl party. My “main dish” was cheese pizza. I also had a variety of appetizers and I got my fill of vegetables from the veggie tray. I brought some “taco bites” based on my Smoky Black Bean Taco recipe. Tim’s idea! 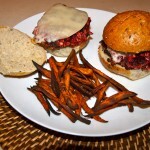 Beet Burgers with sweet potato fries (old picture, but same dinner). This is definitely the most labor-intensive meal I’ve attempted since Luke was born. It was totally worth it, though, since it is one of my favorite meals and I got a lot of leftovers from one night of preparation. The recipe makes 8 burgers, so we had them for dinner two nights, lunch one day, and I froze the rest for one more dinner. I also broke up the preparation by making the rice for the burgers at lunch time and chopping the veggies during nap time. 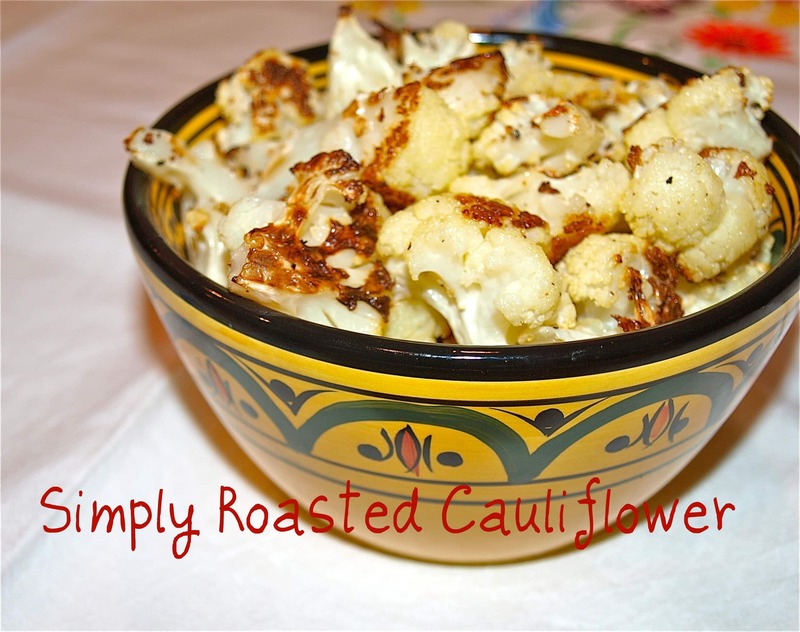 Leftover Beet Burgers with simply roasted cauliflower. Quinoa and vegetable loaded enchiladas. This was a throw together dinner that turned out really well! I made a mixture of quinoa with red peppers, green peppers, corn, and edamame and used organic red pepper and tomato soup for the sauce. (I got the idea to use the soup for the sauce from this post from Heather.) Sorry, I’m clearly not a “take a picture of all your food” kind of blogger. Tahini Lemon Rice and Beans. Two of my favorite meals in one week! I love this one. It’s quick, easy, and very flavorful. I used kidney beans instead of black beans this time because red beans are Meghan’s current favorite beans. Indian take-out. I had a vegetarian dish with chickpeas and spinach along with naan. It was delicious. Need more inspiration? 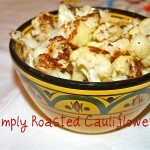 Here’s last week’s post on what we had for dinner. What was the best thing you had for dinner last week? 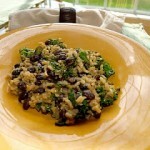 I made your lemon tahini rice and beans a few months ago and loved it. I need to make it again. 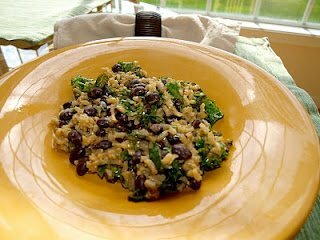 For a simple bean and rice dish it is really good–nice flavors. How do you make your sweet potato fries? I cut them into a long fry shape (I don’t usually peel them), coat them in olive oil, sprinkle with salt and pepper, and roast them in the oven at 375 for about 30 minutes (depends on how thick they are cut). They don’t get crispy like regular fries, but I still love them. I’ve tried a lot of different methods trying to get them crispy in the oven, but haven’t found one that worked yet. Ohhh, I can’t wait for the sesame noodle recipe. Sounds fantastic! And, for not having a meal plan I’d say you and your family ate very well. Great job, mama. Ooooo Can’t wait for the sesame noodle recipe!!! My favorite dinner this week: gf pizza full of veggies and pepperoni to make up for the lack of cheese. tasty. You did well with dinner this week even though you said you weren’t really prepared! The Tahini Lemon Rice and Beans sounds really good! I’ll have to give that a try soon! 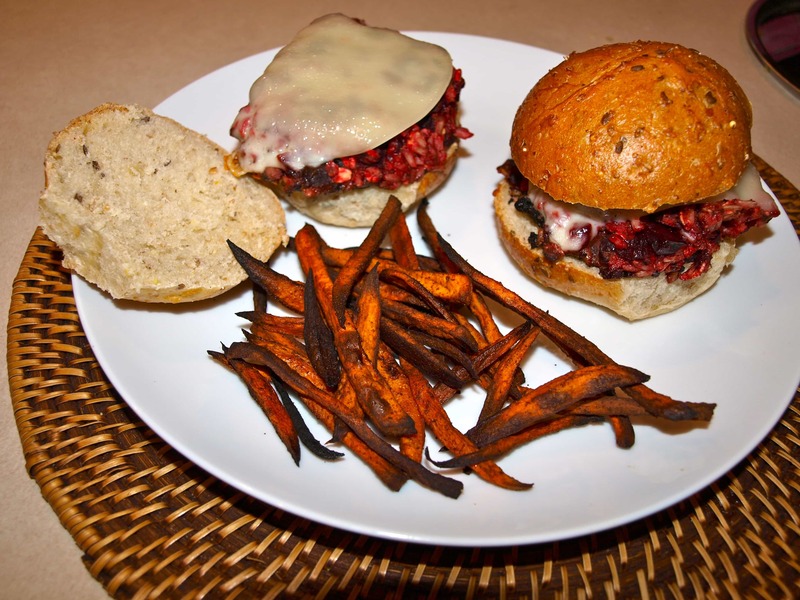 The beet burgers sound good and different! I will have to give those a try! 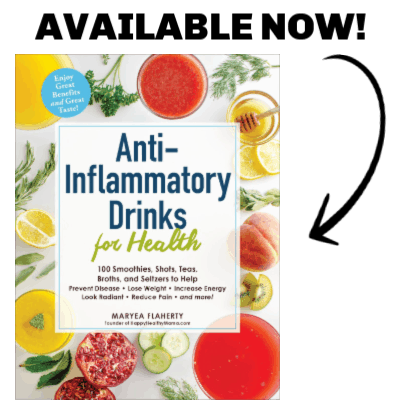 I hope you enjoy them–they are a favorite of mine! You came up with all of that on the fly? You are a rock star. This is where I fail every week!! I don’t plan meals!! I just shop and buy whatever…then when dinner time comes I am like what do I make?????? Then I am always missing something!! UGH! I need to be organized!!! I really want to try the beans and rice and beet burger recipes, they sound good. Hopefully my favorite meal will be what my hubby is making me for dinner tonight for valentines day. He doesn’t cook – ever – and doesn’t know his way around the kitchen at all so could be a disaster. But its the thought that counts, right? My husband cooked for me for Valentine’s Day, too. The food was fantastic but not having to cook was an awesome gift! I love pancakes of all kinds–those sound great!